You're standing in a yarn shop and you see something wonderful and gorgeous. You love it, of course you do, but you can't think of any use for it whatsoever. You haven't got a project in mind, you can't think of one whilst standing there desperately wracking your brains. You don't even really know how far the yardage will go or how much of it you'll need to make the something you haven't even thought of yet. Sound familiar, or is it just me? This is probably the point at which I should put the yarn down and walk away. I should do that, and sometimes I do manage to do that. But more often, I don't. I quite often take it home with me because it's just so pretty and it needs to be mine. I hope you're still with me. Look at that! Doesn't it just make you want to squeal a little bit? I got this just over a year ago on a trip to Loop in London. I went for a bit of a birthday splurge and I just couldn't leave that bundle of joy there in the shop when I could have it at home to love and admire. I had absolutely no idea what to do with it of course, but for that moment, the 'love and admire' part was enough to be going along with. I've had it out a few times over the past year, while rummaging in stash looking for other things and occasionally I'd have a little look through the Ravelry patterns to see what would jump out. Eventually, over Christmas I settled on a cowl pattern. The yardage seemed to mean a hat or cowl was a favourite option and as almost every hat I try looks daft on me, a cowl seemed the wiser choice. I went for the Chickadee Cowl by Kirsten Kapur (Rav link), it seems a popular choice for this yarn as you can just knit and knit until you've used all the yards up. It was nice and simple and of course, as the yarn was so chunky, super quick too. 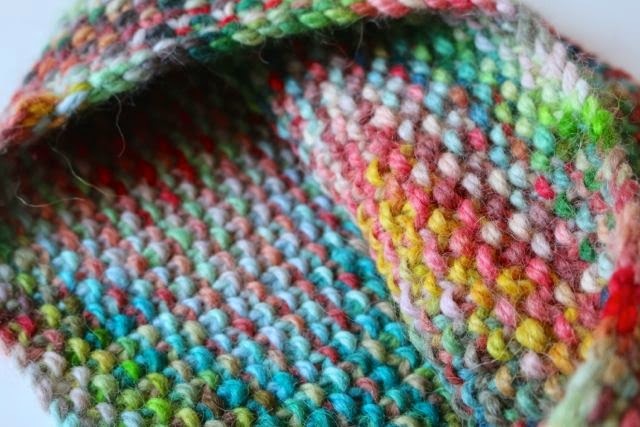 I do love knitting with these multi coloured yarns and seeing all the different shades come over the needles. It's so inspiring, when you are working so close to them, to see colours falling in different combinations. I always find a few new colour palettes to try when working projects like this. The downside though, for me at least, is that the colours nearly always seem to look better in their hank, skein or in this case, bundle, than they do knitted up. This one actually pooled slightly and I'd really rather it hadn't. I much prefer the top third where the colours are more mixed, than the bottom two thirds where the bands of colour are quite clearly defined. I guess it's the control freak in me, but I want the colour to do what I want it to! Still, even if the first heady days of passion don't burn quite so brightly now that the yarn has become a proper knitted thing, I can't say I don't still love it. It's hard not to love something so jolly and it's one of those where the bumpy inside is as good as the smooth woven look of the outside. I think I could wear it either way round to ring the changes. And, it's a ringing endorsement of my 'buy it if you love it' policy because I know if I do love it I will use it... eventually. That yarn is soooo gorgeous and the cowl looks lovely on you. I did exactly the same just last week, looked, loved, longed for, deliberated and bought! It is a fantastic multi coloured soft ball of loveliness sitting in my basket waiting for inspiration to strike. Your post absolutely struck a chord with me! Looking forward to seeing what you create with your next impulse buy!! The yarn is beautiful. I was with you through the whole post. I do the same. Last night I said the yarn picks you, you dont pick it. Certain yarns, certain projects. I just love it. Thanks for sharing. That cowl is just beautiful. It reminds me of gummy bears and springtime and makes me happy to look at! Thank you for sharing. 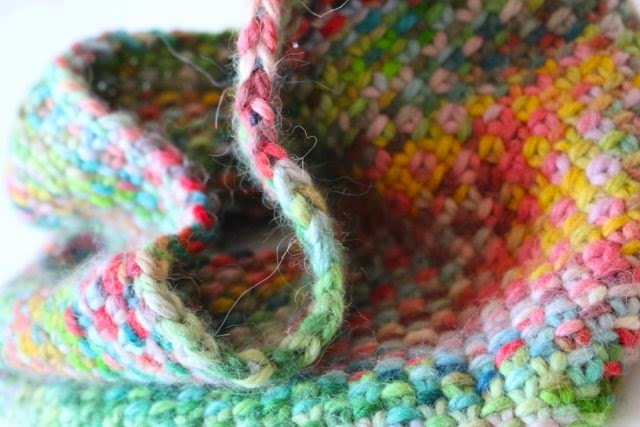 Gorgeous yarn that gives this cowl a beautiful look. 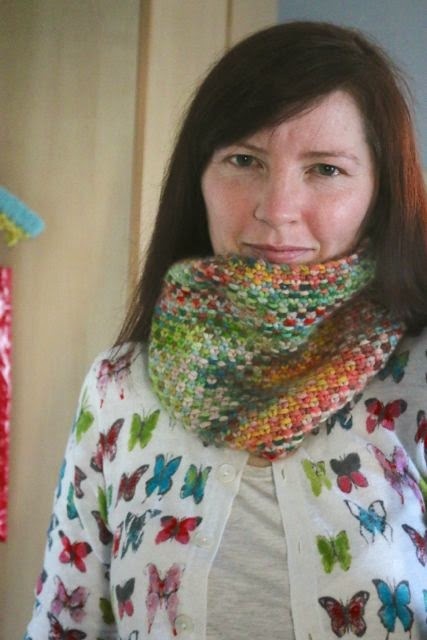 It is lovely, and now I think I must make one, also in a variegated because it is just so pretty! Hi Sandra! I think the cowl is gorgeous! I love how the colours blend together, perhaps more in the cowl than in the skein this time, even though I know what you mean about the opposite. Thanks for your hottie pattern in your previous post. I am crocheting some hotties myself at the moment and this one looks like an easy pattern to follow. It was good to see your podcast the other day, it must have been nervewracking but you did well and it was lovely to hear your voice. 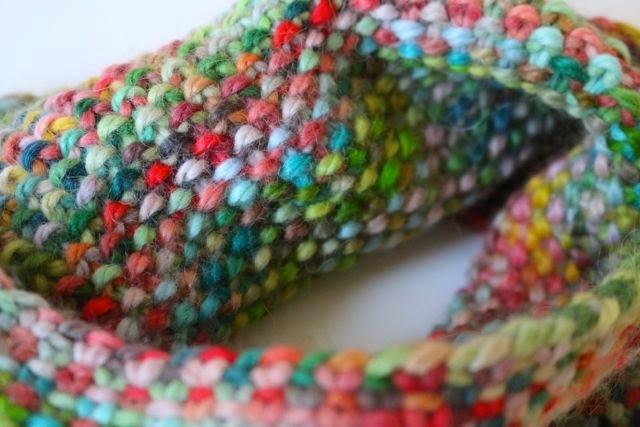 Goes great with your sweater :) I had the same experience of pooling with a linen stitch scarf I crocheted. I just simply broke yarn, rolled a little ball and joined to the skein again. I used the little ball for a fringe in this case, but you could tuck it in at the end. It did break up the pooling and spread the colours in a new way. I agree...it is fun to watch the colours blend row after row! I think yours is a great success! My LYS had a free scarf pattern with purchase of this yarn. I knit it a few years ago... Love, love, love! Oh my I had palpitations looking at that yarn, stunningly pretty on the skein, I would have fallen for it's charms for sure! I agree about seeing yarn knitted up and being a bit meh about it. Sometimes just having it in your stash is enough! 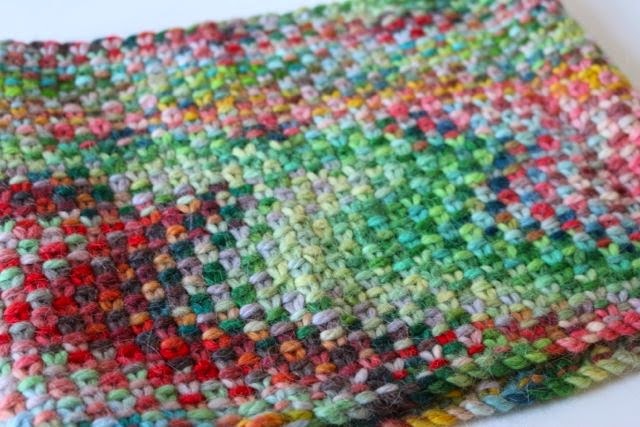 I agree that the woven pattern looks amazing when all the colours are mixed together. Its so hard to know how the changing colours will turn out when picking a pattern! Wow! I really love this yarn! You made a beautiful cowl. Hi there? Where can I buy that gorgeous yarn? I´m from Portugal! So... is there any online shop? Thank you! Oh yes, I've definitely had that experience! Your cowl looks great, what fabulous yarn - there's no way you could have left that in the shop! Have a lovely weekend. Oooh, this is so pretty! 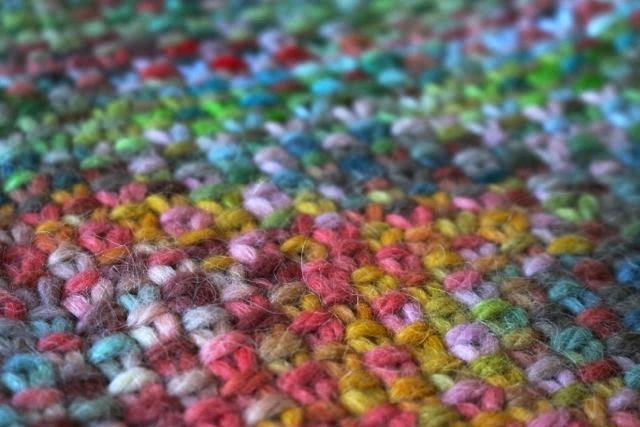 I love multi-coloured yarns in the skein but hardly ever know what to do with them once they've followed me home, so I'll bear this project in mind. I know what you mean about the pooling of colours, and I hate it when it happens with socks for example, but I actually think it suits this project - it almost looks intentional! In any case, it's gorgeous! 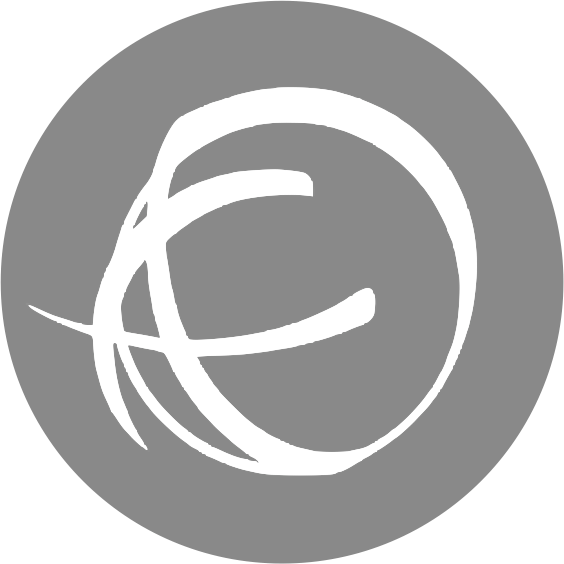 Just discovered your blog and wow thats amazing!!! the close up of the scarf reminds me of cross stitch/tapestry, lovely to see how the yarn knitted up! I'm so glad I'm not the only one in wool shops standing on the spot frowning into the middle distance for half and hour! Well done for using it. I have too many odd balls stuffed into drawers. It does look lovely and cozy. I'm not a huge fan of how some of these hand dyed yarns knit up, but yours looks a bit 3D. Oh it's beautiful! It looks like a painting. Oh yes, Knit Collage - Gypsy Garden in mermaid- it haunted me for ages. I bought it (nearly fainted at the price) knitted a cowl and ......hated it. Wristers....hated them. So now it sits wound up again in a ball possibly to end it's days as the most expensive Barbie blanket ever! Your cowl is lovely and looks great with that cardigan. Oh and i really enjoyed your podcast, i listen to a lot of podcasts but yours is the first i have watched - hope you will do more. That is why I have a couple of big bins of yarn. 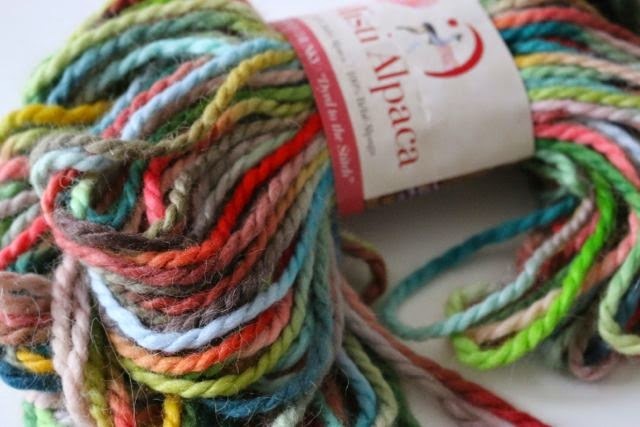 I live Misti Alpaca. Gorgeous yarns. This one knitted up wonderfully. The colors came out like a pixeled puzzle. I do this all the time in the craft shop at the end of my street, I've got a to-crochet list as long as my arm but yet I still feel the need to pop in once a fortnight or so just to make sure there's nothing new in that I need to get my hands on "just in case"! It does look brilliant, and doesn't it match the top well? And go well with a red coat, brown coat, green coat or beige! Good selection. I'm off to London in April; I must remember to factor in time to go to Loop. You've basically described how I buy most of my yarn! Well, not always, but I do often buy "fancy" yarn on a skein without the faintest idea what I'll do with it. Variegated yarn can be a lottery but I think your cowl is really successful. The colours are exquisite, really lovely. It is very pretty, I think it looks a bit like a monet painting!